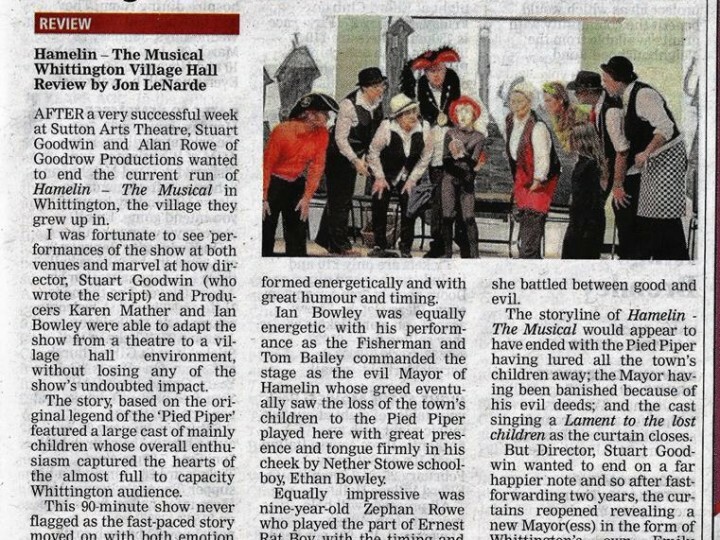 Goodrow Productions > Reviews > ‘The Pied Piper of Hamelin’ A Musical Triumph for Goodrow Productions. 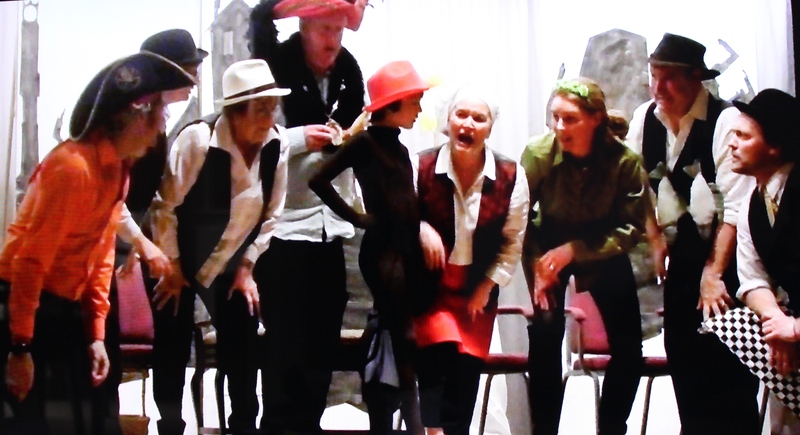 Goodrow Productions successfully presented an early version of their new Musical Play, ‘The Pied Piper of Hamelin’, to a sell out and pleasantly surprised audience at Whittington Village Hall on Friday, 13th April. Many of the audience were attending a Goodrow Production for the first time and without really knowing what to expect. What they experienced was a very Professional and extremely enjoyable show, which right from the catchy rousing opening number, ‘Welcome to Hamelin’, sung by the whole ensemble, through to the sad ‘Lament’ to the lost children 75 minutes later, captured their imagination. 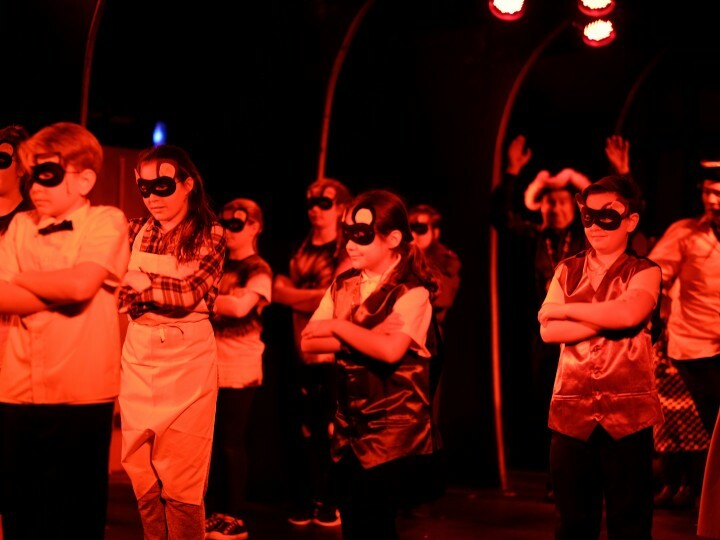 As well as seasoned Senior Actors who all performed admirably, the show featured six very talented youngsters who worked tirelessly and energetically throughout, all taking on multiple roles. 11 year old Ethan Bowley captured his main roll of ‘The Pied Piper’ perfectly, and youngest member of the cast, Zephan Rowe aged 8, played Ernest ‘The Rat Boy’ with confidence and great timing. Eva Bailey as Lottie ‘The Deaf Girl’; Florence Duncan as Suki ‘The Blind Girl’; Olivia Baker as Hetti ‘The Hand’; and Claudia Rae ‘Narrator’ who had been a late addition to the cast, all clearly enjoyed the experience of performing before a live audience and gave excellent enthusiastic performances. For me it was the performances of these six mentioned who captured the hearts of the audience with all six clearly having a future in musical theatre. Kester Lewis as “The Mayor of Hamelin”; Maureen George “The Farmer”; Rachel Duncan as Frau Leithaus “The Lacemaker”; Rebecca Bowley “The Cook”; Tom Bailey “The Fisherman”; and Denise Baker “The Banker”, all seasoned performers added that extra Professionalism to the show. Shows Musical Director, Alan Rowe and Performance Director, Stuart Goodwin also had important pivotal roles. Alan played the bumbling “Town Crier” delivered with a strong ‘Black Country’ accent and Stuart in the dual role as “The Hermit” and “The Reaper”. 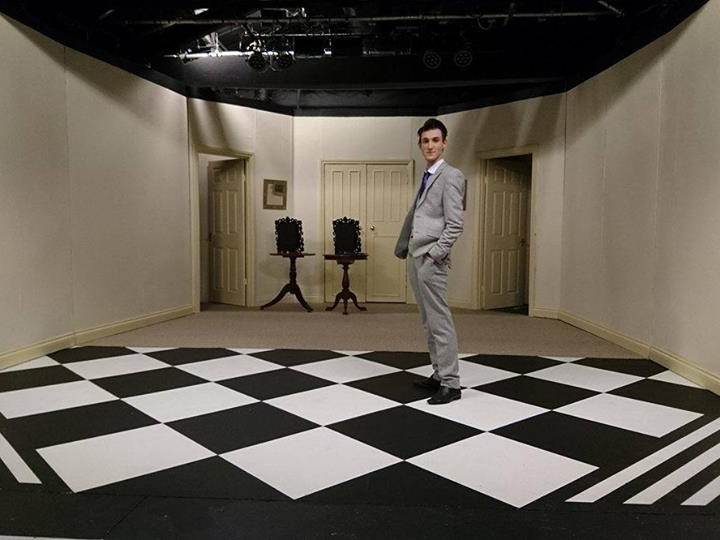 When looking for a follow up to their very successful Christmas showing of ‘A Christmas Carol’; Actor and Director, Stuart Goodwin and singer/songwriter Alan Rowe of Goodrow Productions, wanted to write a new musical which would be suitable for School Productions as well as to a wider theatre audience. This new Musical ‘The Pied Piper of Hamelin’ appears to fulfil this role admirably. The story is well known and particularly suitable for children of all ages, being based on legend and folklore dating from the 13th Century and the real town of Hamelin in Germany. The legend tells of a piper, dressed in multi coloured clothing, who was a rat-catcher hired by the town to lure the rats away with his magic pipe. When the citizens of Hamelin refuse to pay for his services, the angered Pied Piper retaliates by using his magic instrument to play another tune to lure all of the town’s children away. Stuart Goodwin’s developing script has both humour and drama, and Alan Rowe’s original music is both catchy and memorable, and following the success of the Whittington Show and excellent audience comments both after the performance and on Social Media, Stuart is busy extending the script, and Alan has already written several new songs in readiness for a weeks run of the Full Show at Sutton Coldfield Arts Centre in January 2017. Dates and Price Structure will be announced later on the website and on the Goodrow Facebook Page later in the year. Before that it is hoped that the further but lengthened performance of the “Pied Piper of Hamelin” will be showcased again at Whittington Village Hall in December. Goodrow Productions is a non profit making Company and supported ‘The Stan Bowley Trust’ for this Whittington Performance. The Trust raises funds for CyberKnife cancer treatment, giving hope where there was none before. Finally particular thanks to Karen Mather and Ian Bowley for all their hard work behind the scenes in helping the success of this show and also Luke Godfrey for managing the very important sound so well.